King Philip, 2 @ Attleboro, 3 – Final (12 Inn.) – In a game continued from Tuesday, Attleboro earned a walk off win on a sacrifice fly in 12 innings to beat King Philip. In the bottom of the 12th, Robbie Furtado walked, stole second, moved to third on a single from Sam Larkin and scored the winning run on Troy Van Vliet’s sacrifice fly. Eoin Kelleher pitched three scoreless innings in relief on Wednesday, which started in the top of the 10th inning after the game was called through nine innings due to darkness on Tuesday. Ryan Morry had a strong outing, going 6.2 innings while Max Amaral tossed 2.2 scoreless innings in relief. Sharon, 6 @ Canton, 21 – Final – Canton senior Matt Pigeon went 5-for-5 with an RBI and five runs scored to pace the Bulldogs to a big win over visiting Sharon. Matt Connolly added three hits, three RBI and two runs scored for Canton, which totaled 19 hits as a team. Paul Corcoran knocked in a team-high four runs on two hits and three runs scored. Stoughton, 8 @ Foxboro, 4 – Final – Stoughton pounded out 12 hits and scored at least once in each of the first five innings, including three runs in the fifth to jump out to an 8-1 lead over Foxboro. Junior George Currier led the way with three hits, an RBI, and a run scored while Robbie Seaman (RBI, two runs) and Michael Nazzaro (two doubles, RBI, run scored) each had two hits for the Black Knights, who had seven stolen bases on the day. Anthony Mollica and Joe Cavaleri each had two hits for Foxboro. Stoughton’s Evan Jackman earned the win on the mound, allowing two runs (one earned) in five innings of work with five hits, five walks, and three strikeouts. Mansfield, 7 @ Oliver Ames, 0 – Final – Mansfield uses a five-run fourth inning to create the necessary separation in a win on the road at Frothingham. The Hornets took a 1-0 lead in the top of the third and added another single run in the fifth inning. Chris Jenkins had a team-high three hits out of the nine hole, adding an RBI and two runs scored for the Hornets. Dan Saraceno (RBI), John Carney, and Nick Dumouchel (two runs, RB) each had two hits for the Hornets. Carney got the win, allowing just four hits and two walks in six shutout innings, striking out eight. Nick Boudreau had a strong relief performance for the Tigers, allowing one unearned run on six hits, three strikeouts and no walks in 3.1 innings of work. North Attleboro, 5 @ Milford, 3 – Final – North Attleboro broke a tie game with a run in the top of the fifth and added an insurance run in the seventh to get a win on the road at Fino Field. The Hawks scored in the first and second innings to take a 2-0 lead but North Attleboro plated three runs in the top of the third to jump ahead. Jared Penta reached on an infield error, stole second, got to third on a ground out and scored on a Todd Robinson fielder’s choice. Brendan McHugh drew a two-out walk, stole second, scored on a Nick Raneri single to right. Raneri advanced to third on a Dennis Colleran double and scored on an infield single from Jake Palmer to make it 3-2. Milford tied the game in the bottom of the fourth but the Rocketeers jumped back ahead a half inning later. After North loaded the bases with no outs, Milford sophomore Mario Lee came in and limited the Rocketeers to just one run on an infield error. Milford nearly had the tying run in the bottom of the sixth but a terrific relay throw from Shawn Watters was in time for the out at home. Matt Seavey came on in relief for North Attleboro, getting two outs with the tying run at third. Attleboro, 3 @ King Philip, 6 – Final – King Philip erased a 3-0 deficit, plating three runs in each the fifth and sixth innings to secure a win over the Bombardiers. Paige Berdos and Ryan Stagg had singles to start the fifth and both scored on a single from Meg Gorman. Gorman stole home to tie the game 3-3. Gorman came up big in the sixth, knocking in Grace Kelley and Stagg, who had both singled. Faith Turinese pitched a solid game, striking out 6 with six hits allowed and one walk. Oliver Ames, 0 @ Mansfield, 12 – Final (5 inn.) – Sarah Cahill tossed a five-inning shutout and Ella Verheggen paced the Mansfield offense with three hits and five RBI to help the Hornets extend their win streak to four games. Cahill allowed only three hits and struck out six. Kara Bendanillo also had a pair of hits for Mansfield. Katie Abreu hit a double and Emma Varella added a single for the Tigers. Milford, 0 @ North Attleboro, 16 – Final (5 inn.) – North Attleboro junior Bella Erti struck out 14, recording her 300th career strikeout, to lead the Rocketeers to a win over visiting Milford. Erti, Mandi Hanewich, Katie Daby, and Annebelle Hebard each had two hits to pace the North Attleboro offense. Abby Gallagher scored three runs and Alivia Byrne scored twice for North. Stoughton, 2 @ Canton, 13 – Final – Canton scored less than a minute in, raced out to a 6-0 lead after a quarter, and never looked back in a win over Stoughton. Tommy Vaughan led the way with six goals and one assist for the Bulldogs. Griffin Roach, Andrew Canto, and Brendan Clifford each scored two goals and Dan Cohen added one as well. Attleboro, 5 @ Mansfield, 14 – Final – Mansfield built a 7-2 lead at halftime and carried that momentum in the second half to earn a win over Attleboro. Brady Kessler paced the offense with a team-high seven goals while Connor Quirk had four goals and Jake Quirk finished with eight assists. Aidan Sacco and Brian Grant each scored once and had one helper and Jake DiSangro scored once for the Hornets. Joe Plath made seven saves in three quarters of play. King Philip, 11 @ Oliver Ames, 7 – Final – Oliver Ames opened with a pair of leads (1-0, 2-1) but King Philip answered to take a 3-2 lead at the end of one quarter and never surrendered the advantage after that. The Tigers got within one, down 5-4, in the second but KP rattled off three straight goals, including a final tally from Robbie Tartaglia (two goals) with under a minute to go that was set up by a tremendous defensive play by Sean Cullugh. Colin DeVellis led the way with three goals, Andrew Sajdak added two goals and an assist, and Brian McCarthy scored one and had one helper. Tyler Bartlett, Matt Minkwitz, and Kevin Riggs each scored once for KP. Shane Kilkelly led Oliver Ames with three goals while Nick Gillis had a strong game in net for the Tigers. Mansfield, 21 @ Attleboro, 9 – Final – Katy Garvin scored seven times and also recorded seven assists to power Mansfield to a road win and its second straight game with 20-plus goals. Lauren Whitman added six goals and Olivia Murray had a hat trick for the Hornets. Kerry McCabe, Grace Fernandez, Annemarie McCoy, Maggie Danehy, and Paige Peterson all scored once for Mansfield. Franklin, 19 @ Sharon, 6 – Final – Annie Walsh had nine points, five goals and four assists, to lead Franklin to the win. It was the third straight game that the Panthers had held an opponent to six goals or fewer. Kelsey MacCallum added four goals and Jackie O’Neil had a goal and three assists in the win. Franklin goalie Gianna Cameron made six saves. Sharon was led by Emma Eberhardt, who scored four of the team’s six goals. Jenna Goldstein and Bridget McManus each scored for the Eagles and McManus also had a pair of assists. Rose Wald came up with 12 saves against the Franklin attack. Oliver Ames, 6 @ King Philip, 19 – Final – KP continued its strong start to league play with a convincing win on home turf. Olivia Tormey was the top scorer for the Warriors with five goals and a pair of assists. Mackenzie Mazur and Caroline Klim each had hat tricks and Jess Sullivan added a two goals and an assist for KP. Victoria Tormey (two goals) and Shayla Weitzman (goal and an assist) each scored two points and Haley Izydorczak, Dana Truini, and Lily Brown each had a goal. Weitzman also scooped five ground balls and Ava Tormey had a strong defensive game for the Warriors, according to KP coach Kourtnie Wilder. Caroline Watson had four saves in the win. Oliver Ames’ Olivia Piazza had two goals and three assists while Maddie Kullen made 15 saves in net for the Tigers. Canton, 0 @ King Philip, 5 – Final – King Philip won all five matches in straight sets, earning a win over visiting Canton. Nick Putney won 6-1, 6-2 at first singles, Jack Cannon earned a 6-0, 6-0 win at second singles, and Zak Ryan prevailed 7-5, 6-2 at third singles. The team of Nate Ihley and Tyler Dowd picked up a 6-1, 6-2 win at first doubles while Jake Mager and Max Goreham secured a 6-1, 6-1 win at second doubles. Stoughton, 0 @ Franklin, 5 – Final – Franklin’s Liam Marr prevailed in a battle with Stoughton’s Waseem Sablon in a battle of two of the top sophomores in the league, securing a 6-4, -5 win to complete the Panthers’ sweep. Rohan Herur won 6-3, 6-2 at second singles, and Vayshnav Malhotra didn’t drop a game in a 6-0, 6-0 win at third singles. Saketh Saripalli and Lucas Gulick won 6-1, 6-0 at first doubles while Saket Gandham and Shoumik Sompally didn’t lose a game at second doubles. Sharon, 5 @ Taunton, 0 – Final – Sharon won all five matches in straight sets to sweep the Tigers on the road. Danujan Thirumavalavan won 6-2, 6-4 at first singles. Alberto Olivei earned a 6-1, 6-0 win at second singles, and Rueman Bhattacharyya won 6-0, 6-1 at third singles. The team of Max Brody and Max Chen secured a 6-2, 6-1 win at first doubles while Alex Aspel and Jake Ross teamed up for a 6-4, 6-3 win at second doubles. North Attleboro, 5 @ Milford, 0 – Final – North Attleboro earned a win over Milford, winning all five matches in straight sets. Jonah Manso prevailed 7-5, 6-1 at first singles, Alex Pfeffer earned a 6-1, 6-0 win at second singles, and Sam Gallagher won 6-1, 6-1 at third singles. Vikram Senthilakumaran teamed up with Tomas Bentley for a 6-1, 6-1 win at first doubles while Will Redding and Isa Siddiq secured a 6-1, 6-3 win at second doubles. King Philip, 1 @ Canton, 4 – Final – Canton won a pair of matches in both singles and doubles action to secure a win over visiting King Philip. Rachel Kupferman picked up a 6-2, 6-2 win at first singles while Natalie Keppler won 6-4, 6-4 at second singles. The team of Stelina Michaelidis and Rose Hazam notched a 6-4, 6-4 win at first doubles while Kiara Cerruti teamed up with Lily Hazam to win 6-3, 6-2 at second doubles. King Philip’s Mia Valencia won 6-2, 3-0 (injury) at third singles. Oliver Ames, 1 @ Foxboro, 4 – Final – Foxboro swept doubles action and won two more matches in singles action to take down visiting Oliver Ames. Pam Nelson didn’t drop a game in a 6-0, 6-0 win at first singles while Julia Muise secured a 6-1, 6-1 win at third singles. The team of Kendall Milender and Paige Krockta prevailed 6-4, 7-5 at first doubles while Maggie McAuliffe and Neha Jammula won 6-0, 6-2 at second doubles. Oliver Ames’ Maura Kiernan recorded a 6-0, 6-4 win at second singles. Taunton, 1 @ Sharon, 4 – Final – Sharon swept singles action and earned one more win in doubles play to get a win over visiting Taunton. Nupur Shukla was impressive in her match, winning 6-0, 6-0 at first singles. Charlie Martinez added a 6-2, 2-6, 7-6 (7-5) win at second singles and Sophia Fein picked up a 6-2, 6-4 win at third singles. The team of Lauren Glass and Maikala Cheung secured a 7-6 (7-4), 6-3 win at first doubles. Taunton’s Ogechi Ariguzo and Kayla Parrett earned a hard fought 6-4, 7-6 (7-5) win at second doubles. Milford, 2 @ North Attleboro, 3 – Final – The Rocketeers took two wins in singles action and one more in doubles play to defend home court against Milford. Tara Nair won 6-3, 6-2 at first singles and Olivia Wills earned a 6-3, 6-2 win at at third singles for North, while the team of Sam Martino and Hayley Strom picked up a 7-6 (7-1), 6-0 win at first doubles. Juliana France (second singles, 6-1, 6-4) and the team of Cristielly Prado and Ketny Sousa (second doubles, 3-6, 7-6 [7-5], 10-6) won for Milford. King Philip, 3 vs. Keefe Tech, 0 – Final – King Philip defended home court on Wednesday evening, earning a 3-0 sweep (25-17, 25-19, 25-15) over visiting Keefe Tech. Kyle Desrochers had a strong day serving with 13 service points and anchored the defense with a team-high eight digs. Max Armour added seven digs and Cam Corey (24 assists) added six digs. Eric Altobello (nine kills) and Jimmy Peterson (eight kills, five blocks) anchored net play for KP. Taunton, 3 vs. Dighton-Rehoboth, 0 – Final – Taunton’s Alex Tavares (eight kills), Damir Santiago (seven kills), Tyler Stewart (six kills), and Gage Kingman (five kills) combined for 26 kills in a well-balanced attack, leading the Tigers to a 3-0 sweep (25-15, 25-21, 25-19) of Dighton-Rehoboth. Tavares also had a block and three aces, Santiago chipped in with a block, Stewart was strong with four blocks, and Kingman finished with 10 digs and two aces for the Tigers. NORTH ATTLEBORO, Mass. – Last year it was North Attleboro that came into the rivalry game under the lights against Attleboro at Community Field needing a win to keep its playoff hopes alive. The Bombardiers pulled out that win to keep North out of the postseason, but on Wednesday night the roles were reversed and the Rocketeers exacted a measure of revenge. Behind a complete game, four-hitter from senior Peter Cohen and a pair of RBI from senior catcher Zach DeMattio, the Davenport division champion Rocketeers pulled out a 3-1 victory, bringing home the Blue-Red Cup for the first time in three years and officially knocking their rivals out of tournament contention. Offense was in short supply, as the two teams only combined for eight hits. Cohen kept the Bombardiers off-balance and junior Eoin Kelleher limited the high-powered North offense to just four hits as well. The visitors took the lead in the top of the first. Tim Callahan led-off with a double into right center and, with one out, Alvaro Espinal drew a walk. Nick Raneri made a great barehand play on the run on a swinging bunt up the third baseline by Jon Candiales, but both runners moved into scoring position. Corey McKenna singled to left, scoring Callahan, but Brendan McHugh came up firing and threw a strike to DeMattio at the plate, who managed to get the tag on Espinal just before the runner touched home. The lead was short-lived. North answered back in the bottom half of the inning. McHugh started it with a single to left and then stole second. Nick Sinacola moved him to third with a grounder to the right side and DeMattio roped a line drive to right to bring McHugh home. McKenna ended the inning with a barehand pickup and throw on the infield grass to get Raneri. Neither team would manage another hit until a two-out single by Sam Larkin in the top of the fourth. Both went in order in the second after Jeff Gale was caught stealing by Dakota Kirby and both had base runners in the third on a couple of walks, but the pitchers and the defenses were keeping scoring chances to a minimum. That changed in the bottom of the fifth. With one out, nine-hole hitter Ryan Warren dropped down a perfect bunt up the third baseline for North’s first hit since the first. McHugh followed with a walk. Sinacola hit a grounder to second but Attleboro couldn’t complete the double play to end the inning, as the University of Maine-commit hustled down the line to keep the inning alive. DeMattio ripped a single through the left side for his second hit and second RBI of the night to put North back in front. After Nate Pearce walked to load the bases, Raneri took one off the top of his helmet to give North an insurance run. Attleboro went into the seventh down by two trying to keep its playoff hopes alive and Kirby gave the Bombardiers some added energy with a lead off single. Troy Van Vliet came up next and hit a soft liner that North first baseman Aidan Harding was able to snare at full stretch. Cohen fed off the big defensive play and was able to bear down, closing the game out with a strikeout and then a grounder into the hole at short that Shawn Watters not only got to but was able to fire a strike to second to get the game-ending force. This has been the type of loss that has defined Attleboro’s season. The Bombardiers have lost six games by three runs or less this spring, including four by just a single run. North Attleboro (15-1, 12-1) will continue to prepare for the state tournament on Friday night against Bishop Feehan, again under the lights at Community Field. Attleboro (8-11, 6-9) will close out its season on Thursday at home against Stoughton. After missing out on the postseason a year ago, Attleboro head coach Matt Bosh believes his team’s depth and versatility will help the Bombardiers get back there. Junior Eoin Kelleher is back to lead the pitching staff after a stellar sophomore season in which he earned HockomockSports.com Underclassman of the Year honors. Kelleher posted a 1.00 ERA in 35 innings of work, including throwing a no-hitter against rival North. Senior captains Jason Weir and Jon Candiales, senior Drew Pagano along with junior Sam Larkin will all see time on the mound for Big Blue as well. Candiales and Weir also anchor the offense with the former patrolling shortstop and the latter seeing time in both the outfield and first base. Candiales gives the Bombardiers power from the left side of the plate while Weir is a three-year starter that gives Bosh flexibility in the lineup. Larkin will be in the outfield when he isn’t pitching and can use his speed to hurt teams. Corey McKenna returns as the starting second baseman while senior Dakota Kirby is back behind the dish after a year off. Kirby will add pop to the lineup as he hit 0.425 as a sophomore with 10 RBI. A strong core of returning players and a good amount of depth will be keys for the 2018 Canton Bulldogs baseball team. After losing just four players from last year’s team, there is a good mix of experienced players and talented youth for head coach Greg Digirolamo to work with. The Bulldogs will look to three senior captains to the lead the way: Matt Casamento, Robbie Wilkinson, and Tommy DeLello. Casamento is a three-year starter in center field, DeLello will man first base and Wilkinson will try to carry over the momentum from an impressive junior year into 2018. Wilkinson went 3-1 last year with a 1.58 ERA and 13 strikeouts in 31 innings pitched. Wilkinson will be joined in the pitching staff by seniors Austin Maffie, Niko Donovan, and Ryan Hickey, along with juniors Paul Corcoran, Robbie Sullivan, and Kevin McGonigle. Freshman Matt Connolly will also figure into the mix on the mound. Casamento anchors the defense from the center field spot while junior catcher Matt Pigeon and sophomore shortstop Nate Quan bolster the defense up the middle. New Foxboro head coach Derek Suess sees a little bit of the past in his first team as head coach. Suess, a former Warrior himself, said the 2018 version of Foxboro reminds him of a team that won 15 games during his senior year just over a decade ago. 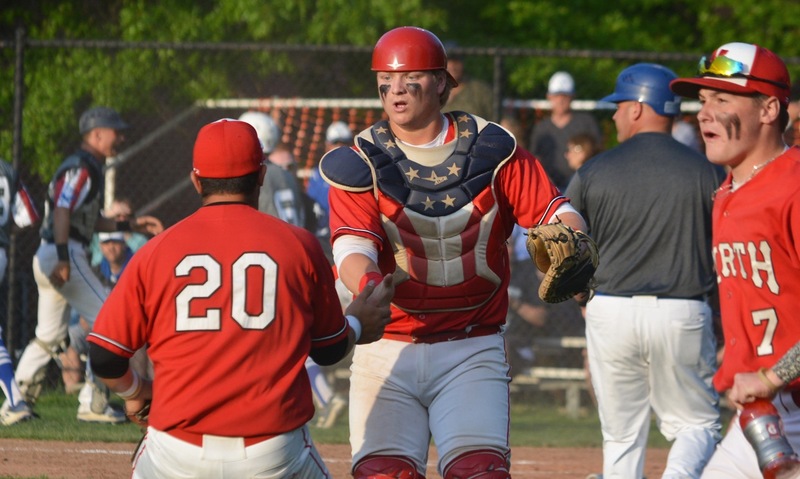 After losing a painful eight games by just one run a season ago, including a near upset of third-seeded and D3 South Finalist Norton in the playoffs, the Warriors will be looking to turn those losses into wins this time around. “We need to make more winning plays to put those tallies in the win column,” Suess said. Junior Anthony Mollica will spearhead the offense after leading the Warriors with a 0.367 batting average a year ago. Senior Chad Bearce and sophomore Joe Cavaleri will bolster the middle of the lineup, freshman Sean Yoest has shown flashes early on at the dish, and seniors Joe Freitas, Matt Rongione, and Jack Franceschelli provide the Warriors with some speed. Senior Steve McLaughlin returns after an impressive 2017 season. Despite posting an 0-6 record, McLaughlin struck out 24 batters in 32.2 innings of work and posted a 1.73 ERA. McLaughlin will be joined by Cavaleri, Yoest, and junior Guy Quartarone in the rotation while senior Robert Theriault returns behind the dish after getting a year of experience last season. Focusing on pitching and defense, the Panthers will be looking to get better each and every day as they try to replicate the success from a season ago. Franklin won the Kelley-Rex division last year, its first league title since 2012. And the mix of pitching and offense put the Panthers in some conversations for Super 8, but the Panthers ended up in the D1 South and bowed out in the quarterfinals after being forced to play on back to back days. The arms that helped the Panthers have so much success last year as almost all back, starting with staff ace senior Jake Noviello. The Fairfield-commit struck out a Hockomock-best 61 batters a year ago, going 6-2 with a 1.65 ERA in 55.1 innings of work. Noviello is complemented by lefty Jason Ulrickson (7-0, 0.80 ERA, 35 K), Bryan Woelfel (3-2, 0.91 ERA, 4 SV, 31 K) and senior James Leofanti. The defense will be anchored by a pair of returning starters in junior shortstop Alex Haba (0.360, 12 runs) and junior catcher Jake Macchi. After just squeaking into the postseason a year ago, first-year KP head coach Greg Kessler is hoping his team will be in contention for a Kelley-Rex division title in 2018. One reason for that is the senior class and the handful of returning players that have plenty of experience at the varsity level. Ben Furfari returns as a key piece of the Warriors’ outfield and lineup. He hit 0.298 last season and will provide the power on offense. Senior Pat Limerick, committed to play at St. Joseph’s (ME), will set the tone as the leadoff hitter. On the mound, senior Jeremy Rhines (2-1, 1.45 ERA) and junior David Morganelli will be the main options while hard-throwing senior Liam Rohan will also be in the mix. Nolan Bradley returns behind the plate as one of the top catchers in the league while sophomore Robbie Jarest will step in to take over at shortstop. There is a lot of optimism surrounding the Mansfield baseball program this season. And with the arms they have back, there’s good reason for it. Senior Tyler Dalton, a UMass Amherst commit, returns after missing the majority of his junior year with an injury. Dalton was tremendous during the 2016 season as a sophomore, posting a 6-2 record while striking out 35 batters and posting a 1.78 ERA. He will be joined on the Hornets’ staff by senior Kevin Dow (UMass Amherst commit, 4-1, 1.93 ERA), junior lefty Connor Sheehan (2.82 ERA, 28 K), and junior Kyle Moran (three saves). Sophomore John Carney will also likely see time on the mound for the Hornets. Senior catcher Cullin Anastasia returns after being named to the 2017 HockomockSports.com Second Team. Anastasia had 19 hits a year ago, knocking in 10 runs and scoring 10 runs as well. Sam Nugent will give the Hornets a spark in center field and on the base path with his speed, Moran picked up plenty of experience at third base last season, and Eric Longley will provide Mansfield with some pop in the middle of the lineup. 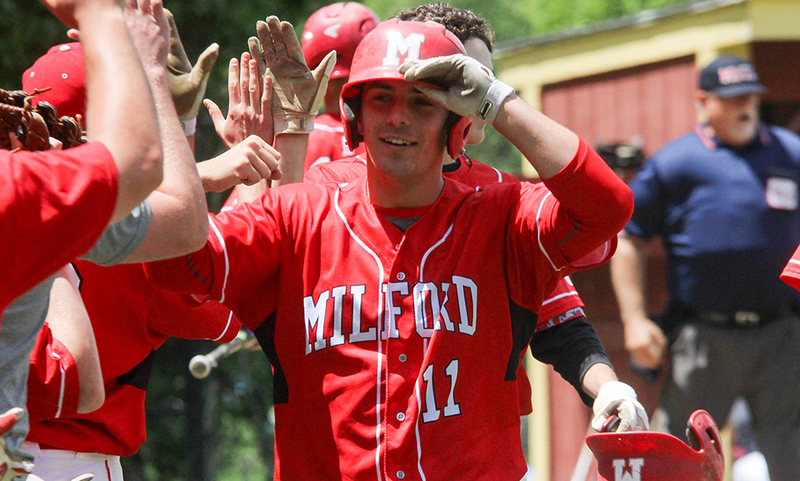 Milford baseball starts a new chapter in its historic history as longtime assistant Alex Dion takes over the reigns of the program. Dion’s first challenge will be having to overcome the loss of a dozen seniors, including team ace Alex Macek, reliable infielders Zack Tamagni and Anthony Arcudi, and hard-hitting outfielder Ryan Goncalves. However, the good news is that Dion has one of the best players at his disposal in Stonehill-commit Aidan Wilde. Wilde had 59 hits between his freshman and sophomore years and added 21 more in the regular season a year ago. After seeing time as a catcher last season, Wilde will mainly man the corner infield positions in 2018. Wilde will be complemented by junior Matt Shaver, who picked up some experience a year ago at both shortstop and on the mound. The Hawks will rely on Shaver to anchor the defense from short and give the offense a spark from the leadoff position. Junior Tyler Almeida will step in behind the dish and will provide some offense from the left side of the plate. Sophomores Luke Rosa and Colby Pires look to be in the mix as well as junior Nick Marcolini, who will pitch and patrol the outfield. North Attleboro didn’t have to go far to find its new coach. Mike Hart takes over for Paul Tobin and Hart truly bleeds Big Red – a graduate from the school and three-sport coach. And expectations are high for the Rocketeers after just missing out on the postseason a year ago. Senior captain Nick Sinacola returns after having an MVP-caliber junior season. Big Red will rely on Sinacola on both sides of the plate, leading the offense (he batted 0.415 last year with 15 runs scored) and being the ace of the staff (48.1 IP, 49 K, 2.01 ERA). Senior captain Zach DeMattio is also back after being named to the 2017 HockomockSports.com First Team, batting 0.333 with 15 RBI and three home runs. Big Red also gets senior Nate Pearce (0.371) back after a strong junior year. Senior Peter Cohen (24 IP, 0.29 ERA) will look to build upon a superb junior year while Nolan Buckley and Jeff Gale bring experience to the outfield. Aidan Harding also has varsity experience and will be in the mix to get innings on the mound along with juniors Matt Wanless, Jake Palmer, Matt Seavey, Nick Raneri, and Ben Arrighi. A lot of the players that helped Joe Abarr have a successful first season as head coach last year are back, which means the Tigers are aiming to replicate that success. Despite finishing in a tie for third in the Kelley-Rex, the Tigers put together the best playoff run of any Hock team, knocking off #2 Dighton-Rehoboth on the road to reach the sectional semifinals. Junior Matt McCormack is back after earning a spot on varsity late in the season this year, and along with classmate Tom Parker, should give OA a solid 1-2 punch. With a handful of capable arms in the mix, the third spot in the rotation is still up for grabs. Abarr won’t have to worry much about anything hit to the left side of the infield as the Tigers return third basemen Chris Pearsons and shortstop Matt Muir, two of the top defensive players at their positions. Both are capable hitters as well and will provide some pop to the lineup. Another returning starter is senior Mitch Goulet. Goulet had a breakout junior campaign in center field (0.347, 7 RBI), catching fire in the second half of the year. Abarr is hoping that momentum will carry over to this season. The Tigers have a battle for the spot behind the plate as both junior Jake Erlich and junior Reid Latham are back, both with experience behind the dish. Sharon is aiming to improve on its six-win season in 2017, and will be looking to ride its senior leadership to do so. Senior captains Max Tarlin and Drew Naisuler are two of the most experienced players in the league and will be spearheading the Eagles’ offense and defense this year. Tarlin (5-4, 46 K, 1.11 ERA) is the anchor of the pitching staff, picking up five of Sharon’s six wins last season. When he’s not on the mound, expect to see Tarlin patrolling shortstop. Naisuler returns as the team’s No. 4 hitter to provide some pop to the lineup and will be a key defensive piece at both center field and first base. The Eagles will also rely on senior Ben Schwartz, who will mainly be catching this year as well as being a major offensive contributor. Junior Noah Kamens will be a major piece of the pitching puzzle after impressing during his sophomore year. Similar to Tarlin, Kamens will be a major player in the offensive lineup and will see time off the mound spent in the outfield. Spencer Singer is transitioning to the outfield and will continue to be one of the players the Eagles look at for offensive production. 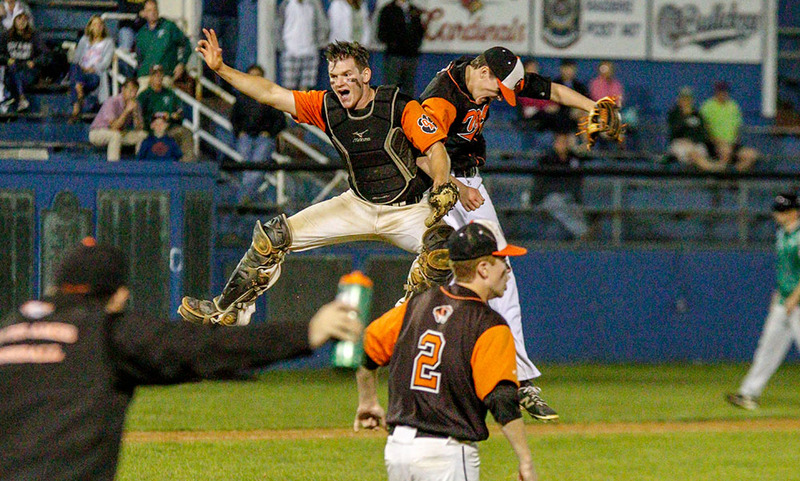 There are a lot of questions to be answered for this year’s Stoughton baseball team, but head coach Mike Armour is excited for his players to rise to the challenge. The Black Knights graduated nearly their entire team (10 of its 13 rostered players), which won its second straight Davenport division title. So not only will Armour be leaning heavily on his three returning players, he is looking for new faces to seize the opportunity. 2017 HockomockSports.com First Team selection and senior captain Ruben Gonzalez returns as one of the top players in the league, both defensively at shortstop and offensively at the plate. Senior Matt Hadley and junior Evan Gibb, both captains, are the other two returning players for the Knights. Gibb has plenty of varsity experience behind the plate and Hadley, although he will miss some time with injury, will be key piece in the outfield. Meanwhile, Armour is looking for sophomores James Genest (first base) and Michael Nazzaro (third base/catcher) to step up and play important roles both offensively and defensively this season. Juniors Kyle Gagnon, Kevin Dixon, and Cian Swierzewski will see time in the outfield and classmate Robbie Seaman will be in the mix for middle infield. For pitching, Gibb will see time on the mound as well as behind the play. Senior Will Eckhart has some varsity experience and junior Zak Paquette will likely log some meaningful innings for the Knights. Seniors Tim Kellogg, Talyor Atkinson, and Mike Anderson provide infield depth and Jack Brown and Ryan Semler will be in the mix in the outfield. There are a lot of good pitchers in the Hockomock League this year, and it looks like the Tigers’ staff could be right near the top of the list. Taunton returns senior Tyler Medeiros, who had a terrific junior campaign and will get junior Jack Moynihan back on the mound. Moynihan was impressive during his freshman year two seasons ago but an injury limited his action on the mound last season. Medeiros fanned 68 batters in 56.1 innings of work, posting a 1.98 ERA to anchor the staff. Look for senior Trevor Pietrzyk and juniors Griffin Tomaszycki and Josh Lajoie to get some meaningful innings on the mound as well. Moynihan will also play a big role in Taunton’s offense this year. While patrolling third base, Moynihan will try to provide some pop in the middle of the lineup. The Tigers also get their top two batters back with senior shortstop Jacob Crawford (0.350, 15 runs) and senior Christian Simoes (0.340, 12 RBI). Taunton will carry nine seniors and eight juniors this season so experience will be key.